We ventured to Formentera for a day of affordable luxury to try the company's new shared luxury boat experience. How many of us have passed a port filled with the most extravagant boats money can buy and thought “one day”? Well, with Smart Charter Ibiza's new shared luxury experience, this dream can be affordable. 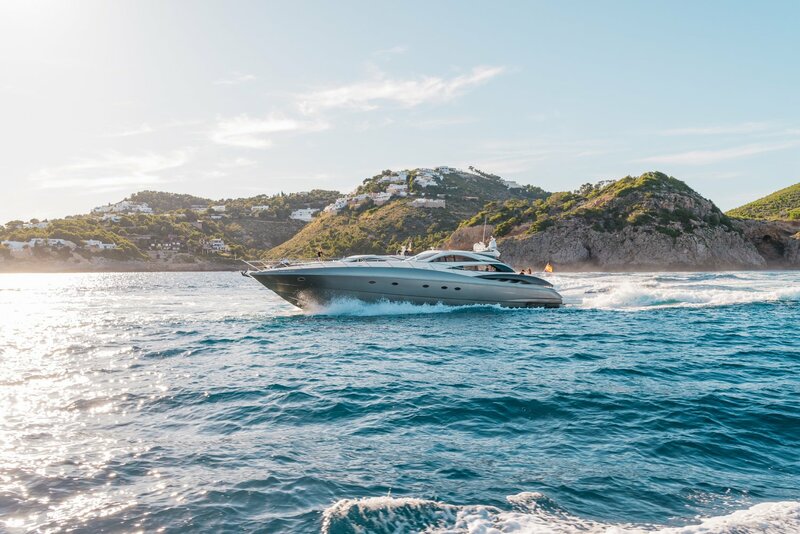 Ibiza Spotlight was fortunate to be invited out to a lavishly luxurious day of sun, sea, and relaxation on its Sunseeker La Cereza yacht, which as part of this new shared service means you don't have to hire a whole boat, just buy a passage on one. Anyone who hasn't come with the family or a bunch of their best friends, need not despair, as now couples or even independent travellers can take to the waves in style for a reasonable sum. Starting in Ibiza Town, our experienced captain Nacho was on hand to guide us out of the port and onto the crystal blue water that surrounds Formentera. The sun was shining, the drinks were chilling, and the group on board – strangers to me, but not for long – was in good spirits. This boat has room for up to 10 people and a skipper at a per person cost that is in most people's reach for a special day out. It includes great food and drink and is a great and glamourous way to enjoy a day alongside the super-yachts and the super-famous and of course make new friends on your Ibiza holiday. Shared chartering is a popular concept. You can hire planes, villas, boats, and more at the fraction of the price to go private. But apart from the cost, it can be a great way to meet groups and couples who are sharing the same holiday experience. There's plenty of room to relax privately as well. After passing the golden beaches of Figueretas and Playa D'en Bossa, Nacho steered the vessel north of Formentera to the islet of S'Espalmador. A favourite to locals and tourists alike, it was no surprise to see many boats moored there for the afternoon. It's a place where there are no buildings and reportedly, it's remained as untouched today as it was thousands of years ago. For sure it was a unique experience to see this pristine islet, one that I won't be forgetting anytime soon. Soon Nacho was about to take us to another equally picturesque place to drop our anchor. Playa Illetes is regarded as one of the most stunning beaches in the world. Its blindingly beautiful white sand and turquoise water are akin to the tropical beaches of the Caribbean. It was the perfect place for a swim stop and it was no surprise that we spent most of the day here, although our skipper did offer the choice to head to other destinations. It was too idyllic to move. Sorry Nacho! This point in the day gave us the chance to sample some of the food and drink on board. There were sandwiches and snacks; alongside soft drinks, water, wine, and beer. It provided the perfect sustenance for socialising after swimming and snorkelling. We later moved on to Es Pujols, which was just a short journey away, with water just as pristine. The tranquil sea was ideal for paddle-boarding, but that doesn't mean I was any good. After falling off more times than I could count it was time to head back to the port, but only after some cave exploration; a definite highlight of the day-out. It was an experience that I didn't think was within reach of my post-student-alioli-and-bread-everyday budget. You don't have to be rich or famous to charter an expensive boat for the day, but who cares if you pretend you are for a few hours, right? Anyone who wants to sit aboard a luxury boat and navigate some of the most beautiful waters and vistas you will possibly ever see should check out Smart Charter Ibiza's new shared luxury experience and get closer to living that dream.